Oh, man! Where do I begin? Okay! I’ve got it. Let’s begin with Nero. *Sighs* Oh, Nero. All I can say is wow. Just, wow. He had me falling in love with him from that first “accidental” bump in the hallway. Holy god. Seriously? He was so cocky and demanding. I loved how much he cared about Elle. He didn’t really seem to put his “family” before her, which had me falling in love with him even more. He was a bad-boy with a heart of gold (when it came to Elle anyway). Loved. Him. Now, on to Elle. She was the poor girl at Legacy Prep School. She shopped at Goodwill for her clothes, which made her not so popular. She loved her best friend Chloe more than anything & always fought to protect her. I loved her & Chloe. She made the wrong choice a few times and made a few mistakes, but I genuinely liked her. I also loved the secondary characters. Chloe, Lucca, Vincent, Amo, and Marie. I thought they were all pretty awesome. Vincent was a lot of fun. I am so looking forward to the books to come. I’m hoping Vincent’s book is about his sister’s best friend. I LOVE the whole best friend’s sister/brother kind of story. & I am so for Chloe & Amo. The way they really disliked each other at the beginning? (love/hate relationships are the bestest). Wowzers. That would make for one great story. It seems like it might just be Chloe & Lucca though. Well, my fingers are crossed anyway. The story also had a lot going in it. I really liked that. It wasn’t just a book about two people falling in love (but those books are really awesome too). There was another story taking place as well. You also got to see a few different sides of the story too. I thought that was pretty cool. I liked getting find out what was going on in the heads of the other characters. 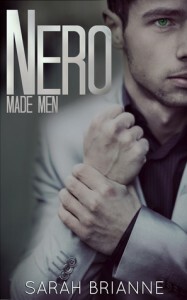 Nero gave me some killer butterflies in my tummy. This isn’t something that happens to me often while reading a book. Okay, fine. Maybe it does. Oh, did I mention how incredibly steamy this book was? No? Well, it was. & It was awesome. Nero has his dirty talk skill mastered. I loved so much about this story. I had a smile plastered on my face the entire time I was reading this book. The. Entire. Time. Well, except maybe when I was “softly” crying for them. This was the author Sarah Brianne’s first book. Personally, I think that she did a fantastic job. There were a few things that were off here and there, but nothing that took away from the story at all. I can’t wait until her next book comes out (Vincent’s story). Yay! Seriously, I enjoyed this story A LOT. If you haven’t read it… Do it. It was a great story that I thoroughly enjoyed.